My kids love to play I Spy in the car. I'm not sure my middle daughter, Ava, really gets it. She will say "I Spy something red." After my oldest guesses awhile and is told she is wrong Ava will finally say "Yes, that's it!" Of course, she has just made it up since we have now driven a mile down the road and could never have seen the item when the game actually started! I guess it doesn't really matter since they are having fun! Have you seen those I Spy games in the gift shops? I think they run about $20. Not really in the budget at that price. Still, they are pretty cool! How about making your own for $1! Now we're talking! You will need an empty jar, rice, and a bunch of small items. I used a plastic mayo jar﻿. I wanted it to be plastic to reduce the risk of breaking. It also had a nice wide mouth so I could easily fit the items inside. 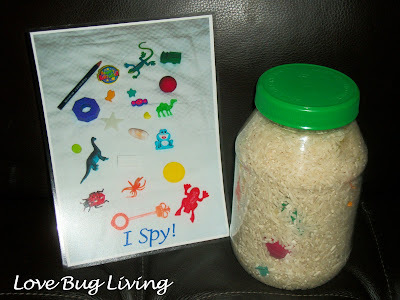 If your kids are like mine, I'm sure you will have no problem finding little items to use in your jar! 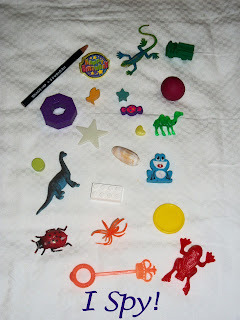 I am constantly finding little toys I have to pick up to keep away from the baby. The items can be anything, but you may choose to do a theme bottle like a sports theme or a princess theme. I went with general items and used small erasers, beads, plastic bugs, pencils, coins, legos, balls, cars, paper clips, Barbie shoes, and shells. 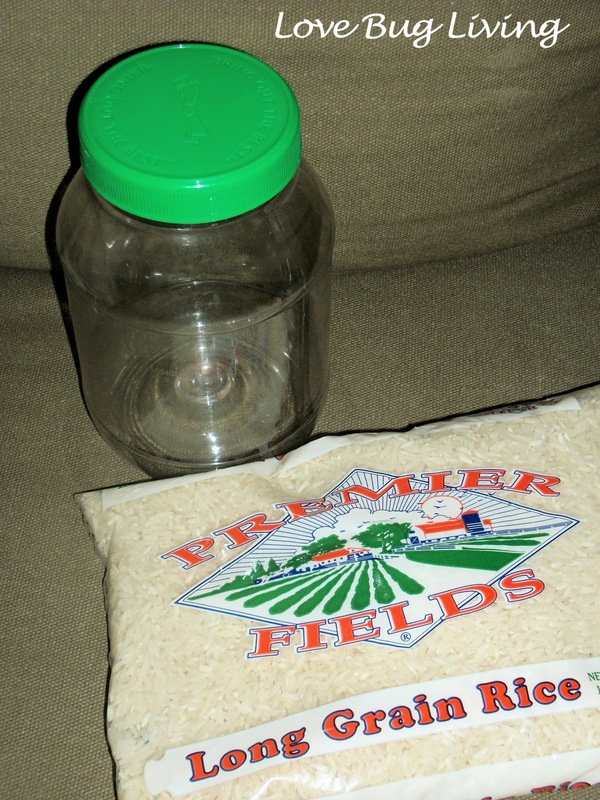 Before making your jar, be sure to lay your little items out and take a picture of all of them. You will want to print out this picture and laminate it to keep with the game. This will allow your child to reference the picture to see what has been found and what else to look for. Start layering your rice and your small toys, alternating to combine them all. Fill your jar until there is a small space left. 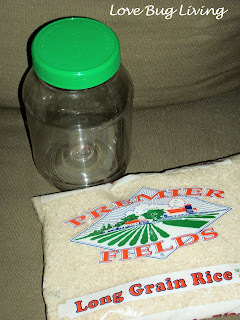 You will need this space to allow the rice to move around so you can search for your items. Place a ring of glue around the inside of your lid and screw in place. 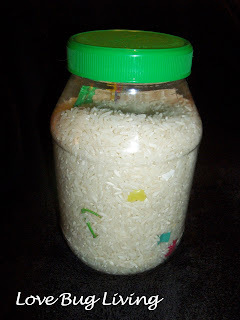 This will keep your little munchkin from opening the jar and spilling the rice. I highly recommend not skipping this step! Time to start Spying your items! I haven't seen these in the store, but this is SUCH a cool idea. You could make a little one for aroad trip too. I will pin this for sure. Following you on a blog hop. Looks like a lot of fun. Hi, found this post at Shine on Fridays. I am a new follower of your blog. I also have three little sweeties (though we also have a little boy on the way). 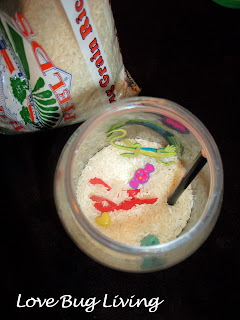 I started my blog sharing all the crafts and activities we have done, though it has fallen away from that somewhat lately. A lot of that is due to pregnancy and not having the energy or motivation to do anything. Anyway, I have seen this idea before, but using soda bottles. I never had that kind of bottle. Never dawned on me to use a mayo jar. Duh. I have got to make one of these and soon. I love it and think the girls would too. Besides, the bigger jar will hold more items and I guess it is easier to fit in items that don't fit in a soda bottle opening. Hope you have a chance to stop by Tots and Me. 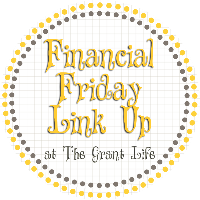 While you are there I invite you to link up with my Lovin' the Weekend Blog HOps while you are there. This is a really brilliant idea! My children always loved the books where they had to find the hidden objects but this is so much better. Oooh, how FUN! So glad you shared at Shine On Fridays! Cute! I posted a link to this on my blog: http://thecraftbarn-ny.blogspot.com/2011/12/crafty-friday-121611.html thru my pinterest board.